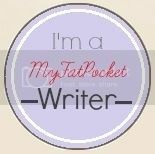 A Thing (or Two) About Holly Jean: I'm A Santarina! This year, The Body Shop theme is Joy to the World. The Body Shop products are ethical and contribute to Community Fair Trade projects. So when you think of Body Shop, you know that not only does using their indulgent and luxurious products bring joy to the user, but because of Fair Trade and other community conscious steps which the Body Shop undertakes in producing their products, the farmers who produce the materials to make these wonderful products are not exploited. 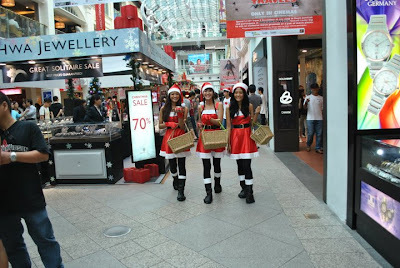 Last Saturday, I was a Santarina for The Body Shop's Give The Gift Of Joy campaign. That's me, Danielle and Shay in our costumes, with baskets of lovely product samples from the Body Shop. We did product demontrations of the Cranberry Body Butter, Cranberry Shimmer Lotion and Cranberry Handcream. We gave out thousands of vials of Dreams Unlimited Perfume as well as the Rainforest Moisture Hair Butter sachets. At the end of the night, exhausted but still joyful... here's the whole gang... Santarinas, Bianca, and the walking ads crew. 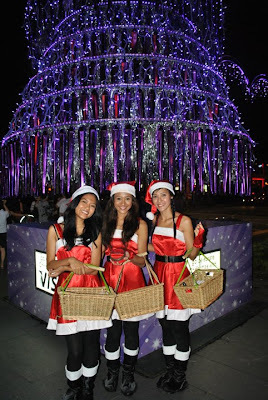 Catch Jamie, Danielle and myself on the - 18th, 19th, 22nd and 23rd December, from 5pm - 8pm along Orchard Road. Loads more goodies in store for you! Be Part of Singapore's Largest Street Carolling Event! 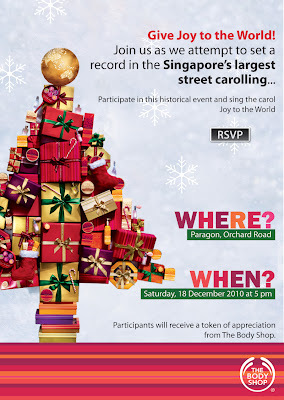 This Saturday (18dec) at 5pm, join us at the Paragon, Orchard Road! We're attempting to set the record for the largest street carolling! 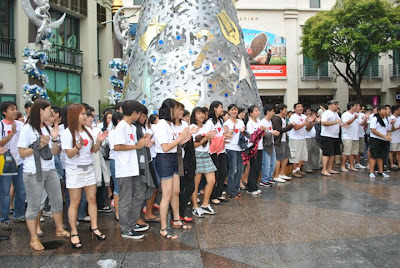 Come down to the Paragon and join in the cheer.. we'll all be singing Joy To The World. We have to sing it 3 times in order to set the record for the largest street carolling event. Each and every participant counts. Help us set this amazing record!! U might want to consider letting your hair down instead of braiding your hair. When you got thin/fine hair, braiding looks like 2 long thin strips. Just an honest comment from your reader. No offence. Ya... i know. i Agree with you. but its so hot n sticky... on the.streets 4hours straight. maybe will do just one braid this wkend. I wanna read the removed post! You, Jamie and Danielle are lovely Christmas Carrols! Anyone would be lucky to recieve gifts from you! @ anonymous.. tht deleted post is just a repeated post... the exact same comment as the one I made above the "deleted" one. I got trigger happy and clicked twice. You are already 30 years old, why do you accept those event jobs as "event gals" that those teenagers and school gals are doing? I mean, they are doing for extra pocket money, but why would you want to when you are 30 years old? just asking, hope you dont mind. - i don't get paid the same as those teenage 'event gals' you're talking about. That said, I'm still worth their every penny (!!! ), as the teenage event girls won't give it exposure, might not know enough when it comes down to explaining stuff abt the body shop, it's concept, fair trade programmes, the products, etc.